It’s 11.00 a.m. on a lovely Sunday morning and already I’ve got 13 new emails in my inbox. Not for long. 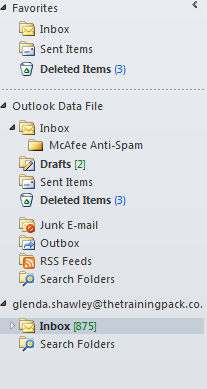 Within 10 minutes I have given them all a cursory glance and deleted all but one from a client. Today is typical. On a weekday there are probably six to eight emails when I wake up; by the end of the day there’ll be over 200 awaiting my attention. Most will get deleted promptly. Email is brilliant. It allows us to communicate quickly, to get our message out to many people all at once and to keep a record of our correspondence. When I was on jury service some years ago email even allowed us to convict the defendant! That’s only one of the dangers. Email can consume masses of our time if we let it. It can be an excuse for procrastination. We can upset people by not responding to their agenda in their timescale. Email can be a substitute for talking to people. We can go overboard with the number of communications we send. One American business development ‘guru’ sent me three or four emails a day. Yes a day! To me that is abuse. I have unsubscribed from her list. One attendee at a recent networking event emailed later in the day to say that she had added me to her database. That is abuse. Sharing my business card with her did not amount to giving her permission to add me to her database. A personal email following up something I had said at the event with an invitation to subscribe to her list would have been acceptable. Someone else I met at an event sent me his newsletter. He said he had lots of exciting news. I expected to hear about his business. He wrote about films. He is not in the film industry! That is abuse. I am not interested in film. I can get all the film news I want from my fanatical son. I would be interested in this guy’s work, that is why I am on his list. He has one last chance to communicate something I want to read. So how do you avoid abusing people by email? Only email with permission, it’s the law in most countries and good practice. Only email on topics of interest to the recipient. Segment your list and restrict news sent to each interest group. Don’t email too often. Find other ways to communicate e.g. Facebook, Twitter, Google+ Invite people to subscribe to your blog. Give people the chance to unsubscribe and if your email client allows it give them an opportunity to tell you why they are leaving you. Clean your database regularly to make sure your list is current and valid. Don’t take an unsubscribe too personally and don’t let it put you off sending regular emails to your list. Even happy clients will forget you if you don’t stay in touch. Whilst it is important to work hard to build the size of your list it is more important to have a list of people who are genuinely interested in your work. Some people may unsubscribe from your email list because they are connected with you on social media and find that easier to manage than a swelling inbox. So publish your newsletters on social media as well as by sending them to the people on your list, you may gain more subscribers than you lose. Entertain and inform your readers and most will stay connected and few will feel abused. This entry was posted in Communication, Marketing, Small business advice and tagged Business, Electronic mailing list, Email client, Facebook, Google, Marketing, Twitter by glendashawley. Bookmark the permalink.